Chevrolet today unveiled its 2020 Silverado HD High Country, the second of five trim level models for the new pickup. The trim levels also include Work Truck, Custom, LT, and LTZ. Each 2020 Silverado HD model offers a different level of design, features, and technology to meet each customer’s needs. The HD follows the Silverado 1500, which offers eight trim levels. “Truck customers are very clear: They want the perfect truck for them and not a one-size-fits-most truck compromised for the masses,” says Mike Simcoe, vice president of global design at General Motors. 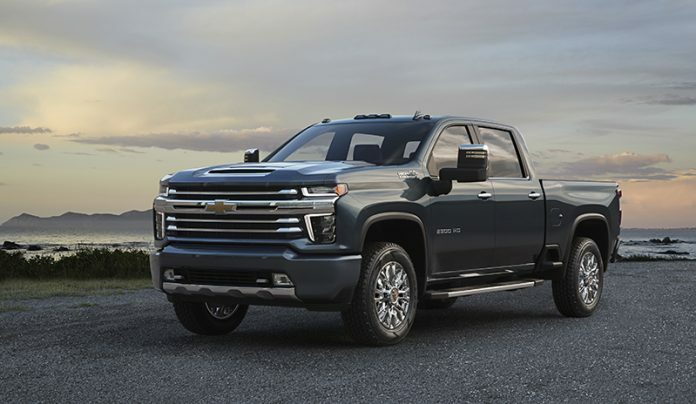 The Silverado HD models offer exterior design details including grilles featuring either the Chevrolet stamped bar or the Chevrolet bowtie and a mix of black, body color, chrome, or two-tone metallic trim exclusive to High Country models. The 2020 Silverado HD is expected to go on sale in mid-2019.